When it comes to my eating habits, Brian would probably sum it up with the word "weird". things have to be cooked a certain way, taste a certain way and so on. It's hard when you have to compensate with all of your other 5 senses working overtime. I always tell Brian that I taste things differently. Whether it be simply the texture or seasoning. For example, I dislike tomatoes. I've tried them but just cant do it. However, if said tomato is mixed into a taco dip, I can do it. That is weird right?! Let's get to today's point, although I really could talk about my eating habits all day. Today's recipe focuses on another food I truly dislike except when it's in the below meal. Spinach! I've smelt it and have looked it over but wont touch it. When I was first introduced to this appetizer at a restaurant, I wasn't too sure. The combination didn't sound pleasing...and then I tried it! I could eat it all day. Back in 2011 my dad and I would get To-Go orders of this and bags of chips the restaurant gives for dinner all the time. It's just way too good! 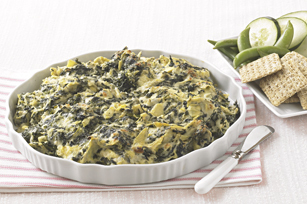 MIX ingredients; spoon into 9-inch quiche dish or pie plate. My husband loves this! I may need to try this one! LT hates tomatos too, but will drench everything in ketchup!! I totally understand weird food issues! Oh and I can eat the whole bowl of spinach dip which is why I steer clear of it.